Are your Volvo vehicle and the road fairly acquainted? Do you fit within having accumulated 149,000km to 249,999km? Well, you are qualified to join the Volvo Laval High Mileage Club! Be a part of the club and get a 10% discount on labour and 5% discount on parts. If you have 250,000km or more, you are entitled to a 15% discount on labour and a 10% discount on parts. It's never felt so good to have so many kilometers on your Volvo! 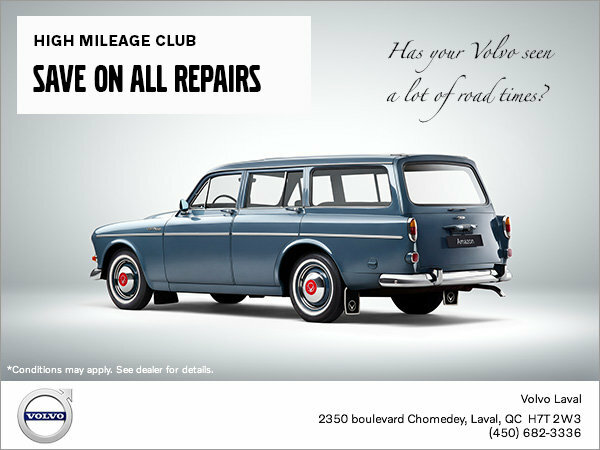 Also, take advantage of a Lifetime Warranty on Volvo Genuine Parts and labour during any service or maintenance visit!